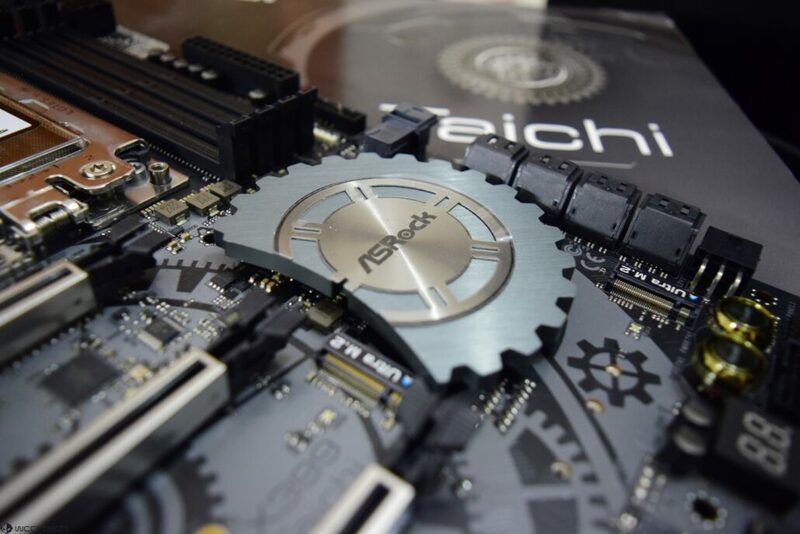 While being a powerful motherboard, the ASRock X399 Taichi follows the ATX form factor and will be compatible with almost every casing unless you are using a Mini ITX chassis. 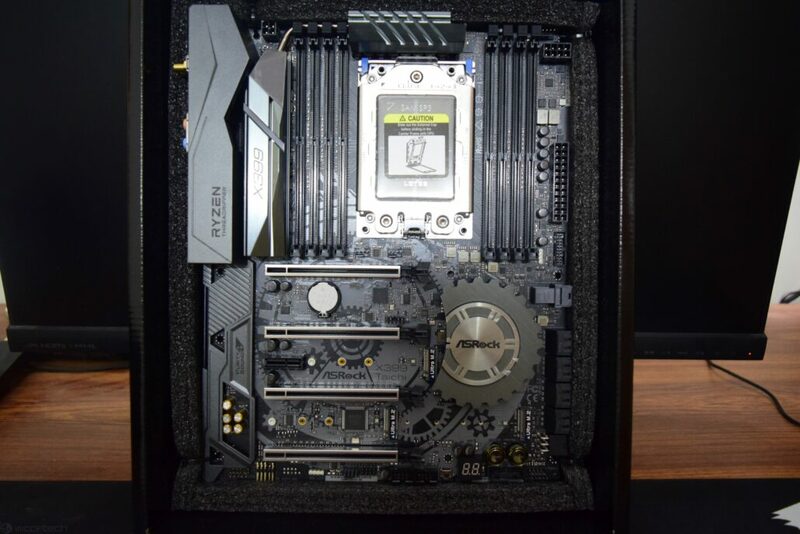 There are currently no Mini ITX X399 motherboards in the market and that is true for all HEDT platforms. 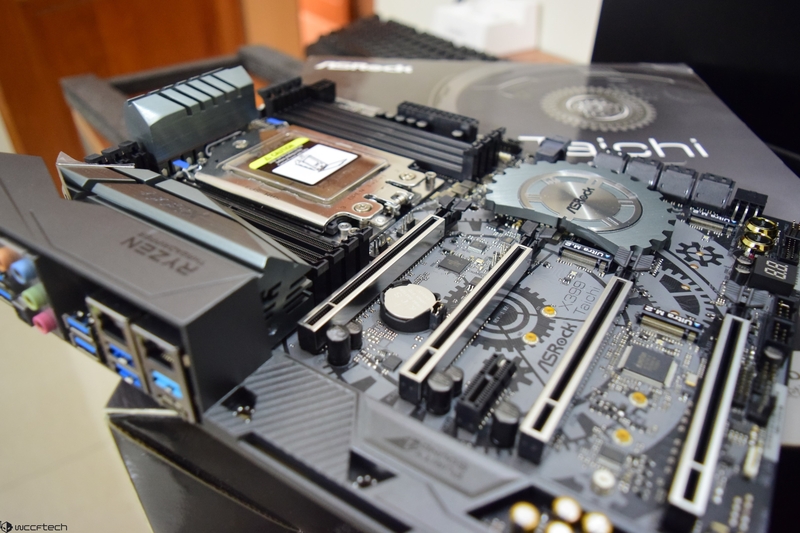 While ASRock does has a Mini ITX X299 motherboard, the X399 socket does not allow design of such standards in the X399 family. 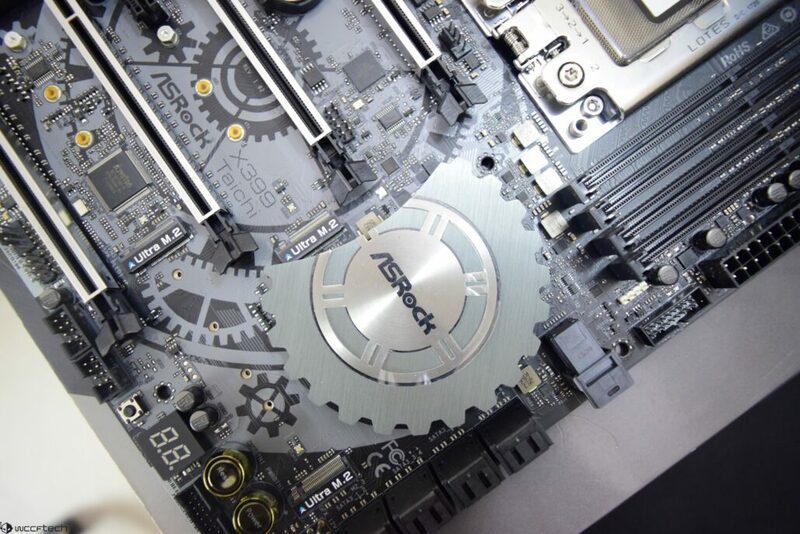 The motherboard comes with a simplistic design language that follows ASRock’s Gear design as seen on previous Taichi motherboards. 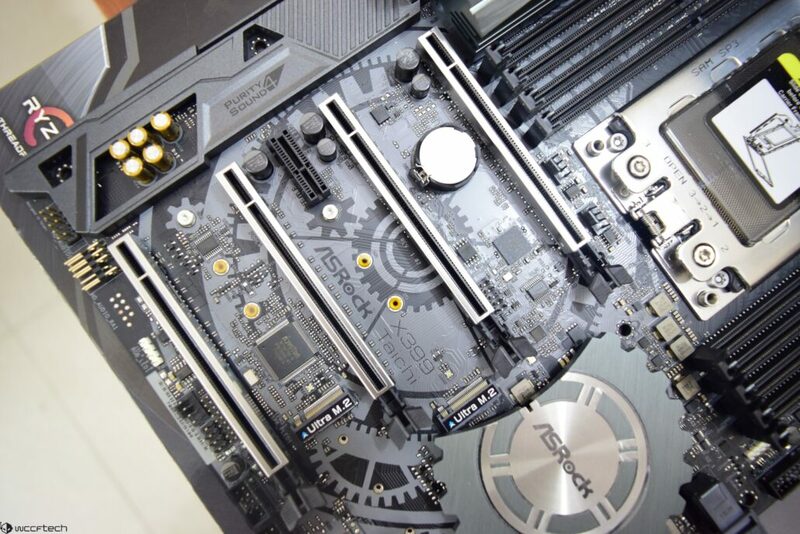 ASRock has chosen the grey and black color scheme for this motherboard and it looks great. The large TR4 socket can be seen at the top of the motherboard. This is the same SP4 design from the server EPYC motherboard, re-engineered for the HEDT masses. The socket has a plastic cover that slides in and out with ease. 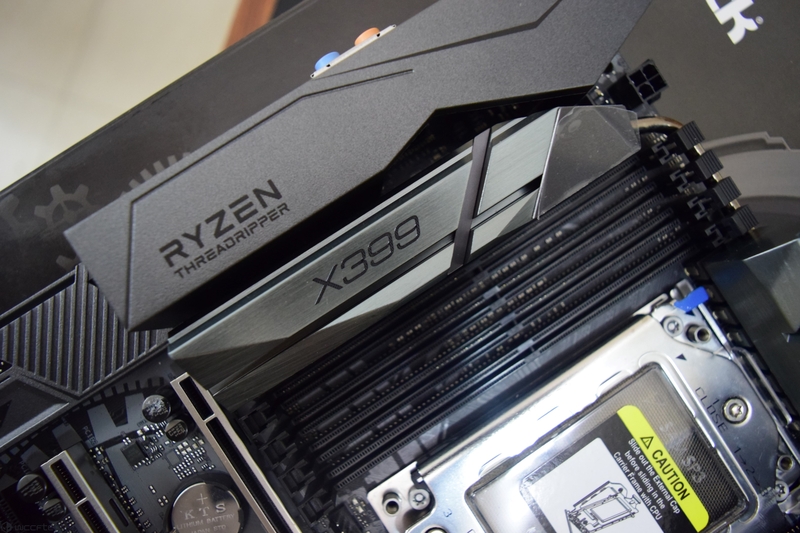 The AMD Ryzen Threadripper processors also slide in the socket with ease after removal of the protective cover. 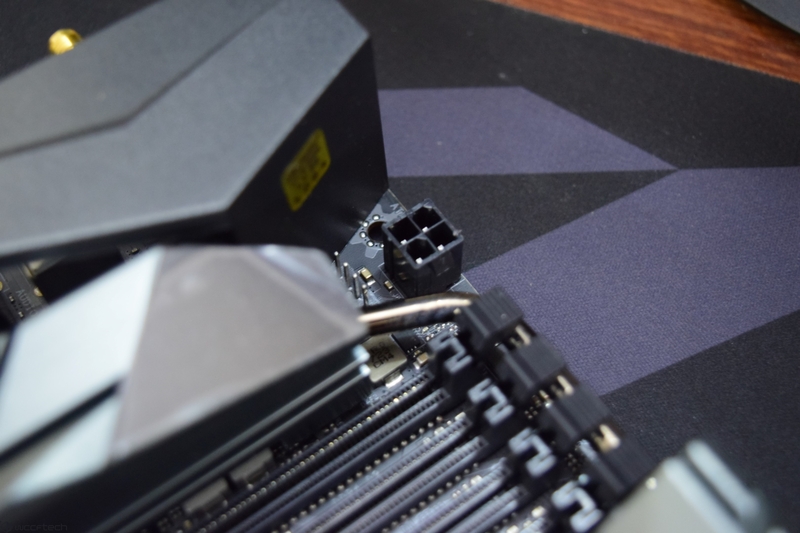 All X399 motherboards are shipped with this cover since we are talking about 4094 pins and one damaged pin can cause permanent damage to the board. Talking about the socket, it is also the largest ever designed for a consumer grade motherboard and the number of pins inside the socket are mind blowing. You can fit in almost four consumer Intel CPUs in the socket (although they won’t work). Around the socket are four DDR4 DIMM slots which can support quad channel memory with clock speeds up to 3600 MHz (OC+). 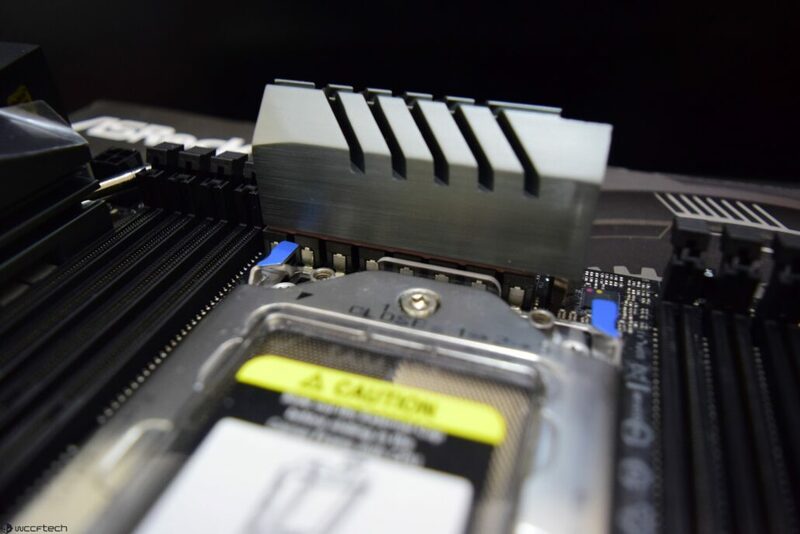 The system is designed to operate both non-ECC and ECC (UDIMM) memory and up to 128 GB in capacity. Scattered around the CPU socket are 11 power phases that use the IR Digital PWM unit for voltage and power regulation. 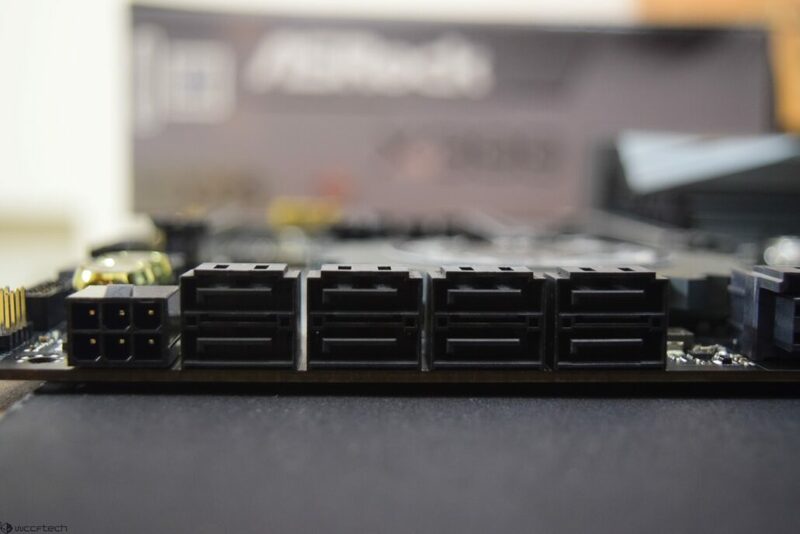 The motherboard is based on the ASRock Super Alloy technology that has a range of features including 60A Dr.MOS power chokes. 12K black capacitors, a high density glass fabric PCB and premium alloy chokes for the memory too. 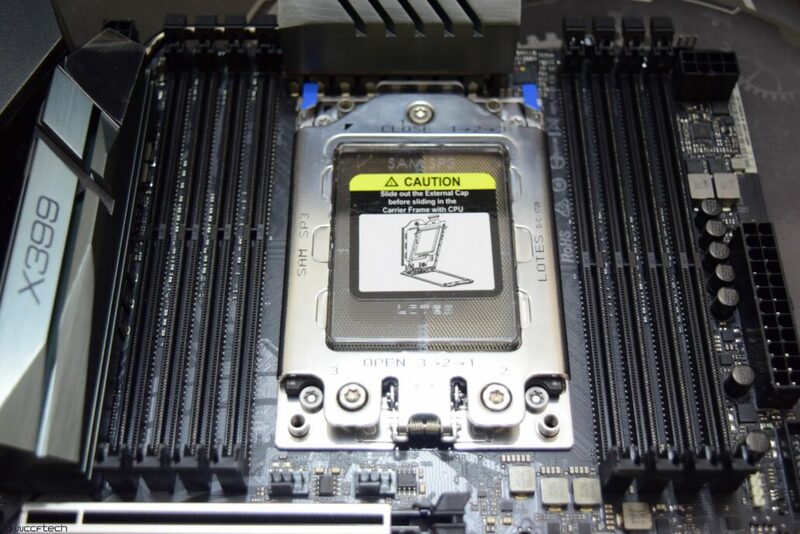 The motherboard is supplied power through a 24 pin ATX connector while the CPU socket is ran by a 8 and 4 pin power configuration. This is enough to feed juice to the high-end Ryzen Threadripper CPUs. Overclocking would be a breeze on high-end motherboards of this design. 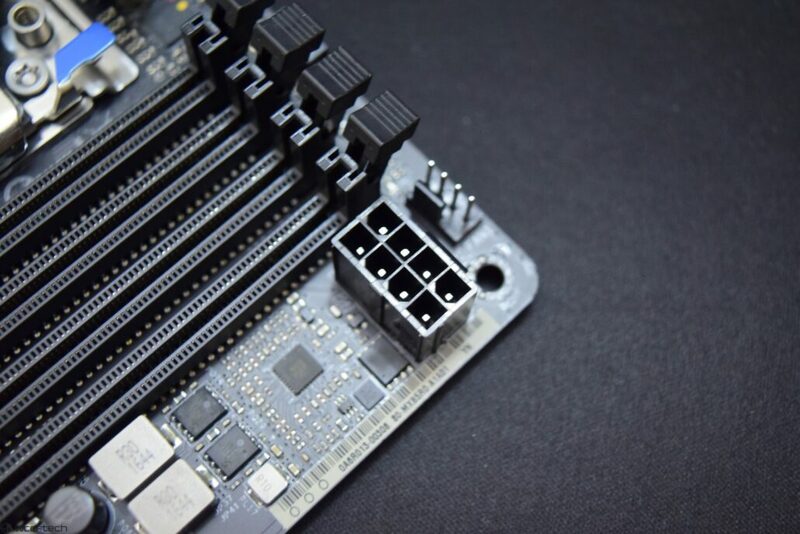 The motherboard uses premium aluminum metal heatsinks that make direct contact with the VRM and also include copper heatpipe design to channel heat. This effectively leads to better cooling on the motherboard. 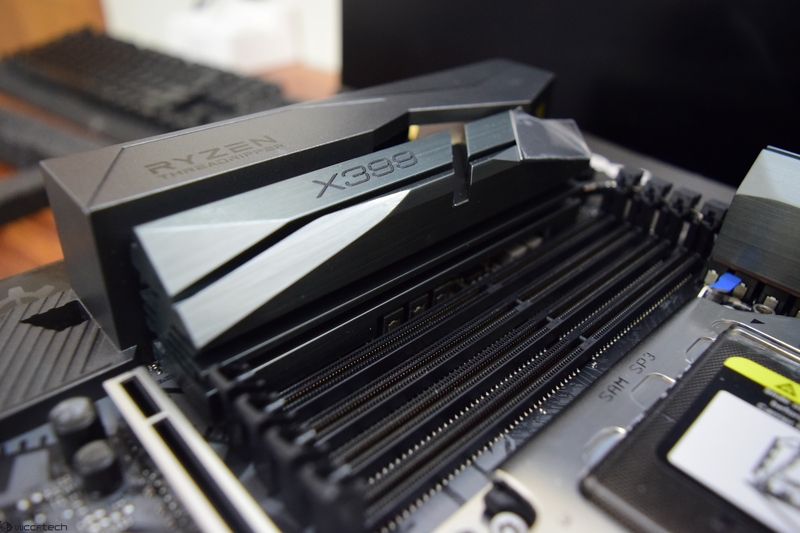 The AMD X399 chipset is hidden beneath a large Gear designed heatsink which is etched with the ASRock label. 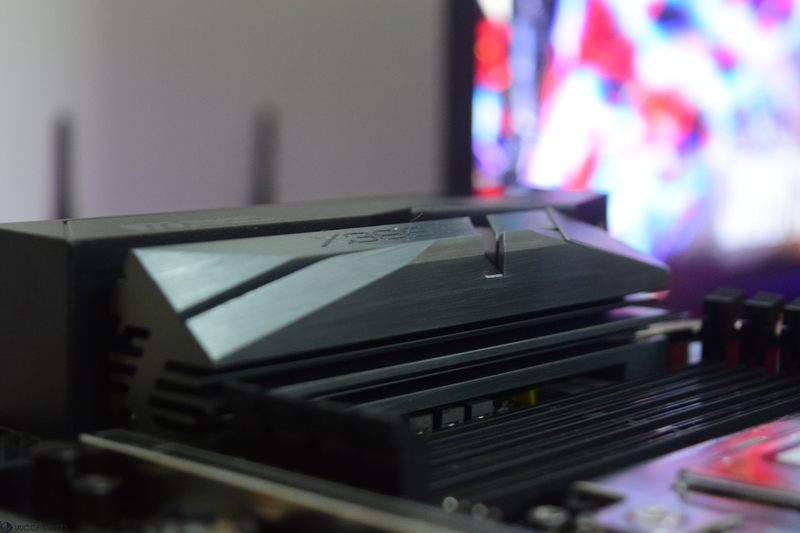 This is a fairly big heatsink which embeds ASRock’s RGB LED feature that can be tuned via their bundled software. In terms of storage, we are looking at 8 SATA 3 6Gbps ports which support RAID, 3 Ultra M.2 ports which run on PCI-e x4 (32 GB/s) speeds. There’s also a single U.2 port if you are running an Intel SSD with U.2 design although that doesn’t seem much of a case nowadays with M.2 in the lead. If a U.2 is connected, that will lead to one M.2 slot being disabled. 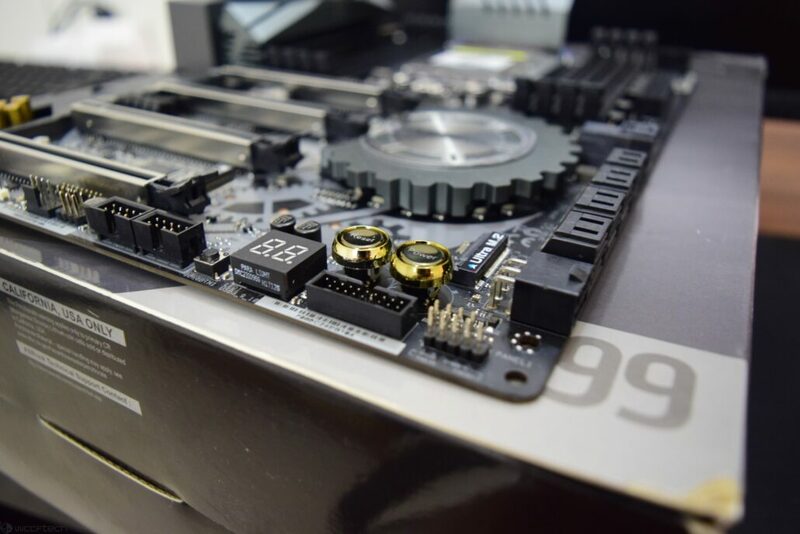 The motherboard has four PCI-e 3.0 x16 slots which operate at (PCIE1/PCIE2/PCIE4/PCIE5: single at x16 (PCIE1); dual at x16 (PCIE1) / x16 (PCIE4); triple at x16 (PCIE1) / x8 (PCIE2) / x16 (PCIE4); quad at x16 (PCIE1) / x8 (PCIE2) / x16 (PCIE4) / x8 (PCIE5)). 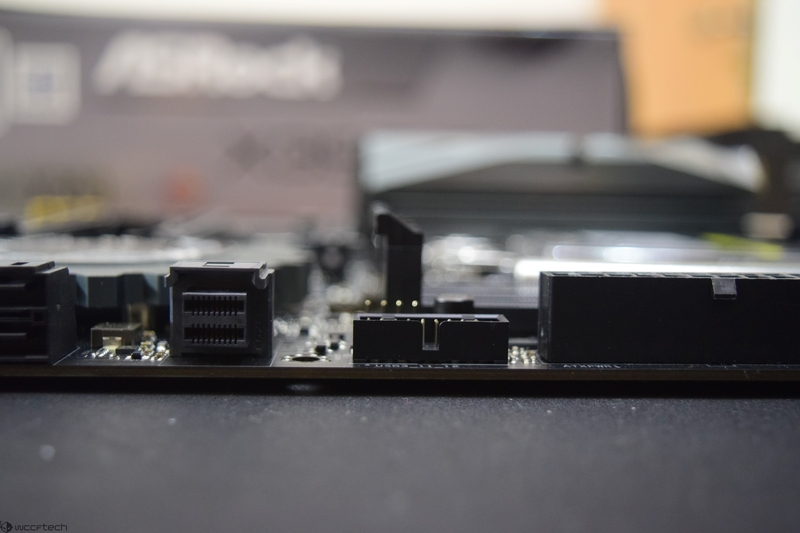 The motherboard can house four way SLI and Crossfire GPUs and there is an additional 6 pin power connector on board the motherboard which can be used to deliver additional power to the PCI-express slots when all of them are populated at once. The Purity Sound 4 system on board the motherboard also comes with a plastic shield and powers a 7.1 channel HD audio (Realtek ALC1220 Audio Codec). The isolated PCB uses TI NE5532 Premium Headset Amplifier for Front Panel Audio Connector and supports DTS connect. The I/O port comes with a shielded cover which reads Ryzen Threadripper on the top. Similarly, the heatsink next to the I/O cover reads X399 and they look great. 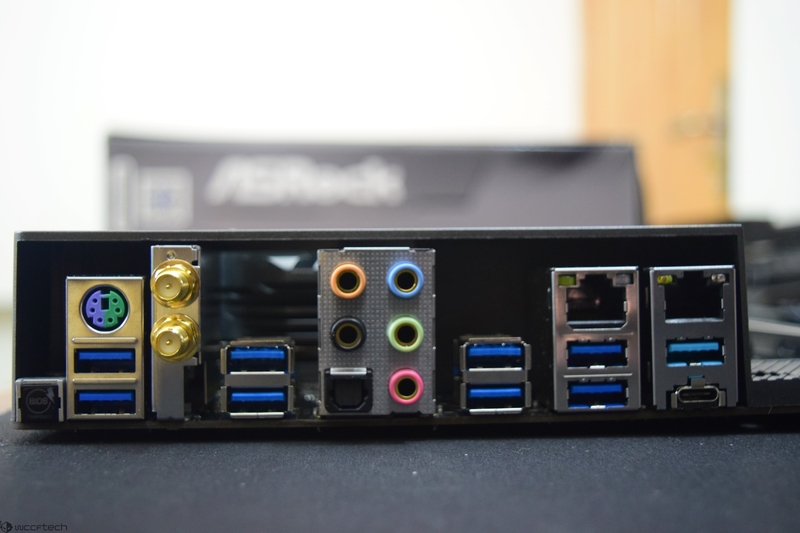 I/O on the ASRock X399 Taichi includes 2 Antenna ports, a PS/2 port, a single Optical SPDIF out port, 2 USB 3.1 (Type-A + Type-C) ports, 8 USB 3.1 ports, 2 RJ-45 LAN ports, a single BIOS flash back switch and a high quality HD audio jack.